The Sri Lanka Press Institute (SLPI) trainer Ms. Radhika Guneratne conducting a session on Right to Information law (RTI) to a group of journalists in Gamapaha. 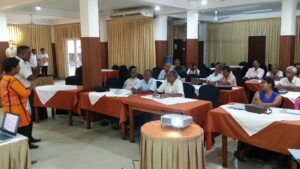 The Sri Lanka Press Institute (SLPI) conducted training for a group of journalists at the Wijeya Newspapers Lminited on Right to Information law (RTI). The sessions were facilitated by Mr. Wijayananda Jayaweera (extreme left) and other SLPI trainers.